As you travel by snowmobile along trails or upon roadways open to snowmobiles there will be a variety of traffic signs that apply to all snowmobile operators. When on roads, remember that all traffic signs for automobiles also apply to snowmobiles, including highway speed limits if you are operating in a highway road ditch. Click the curriculum tab to begin this course section. It is important to understand the meaning of all trail signs to help you stay out of danger and make your trip more enjoyable. Always respect trail signs and follow the rules they communicate since some help protect the rights of adjacent property owners as well as protect future snowmobiling access. Examples of common snowmobile trail signs are shown below. Remember that individual states and provinces may have slightly different signs for their snowmobile trails, so always check with the jurisdiction you're riding in for correct local signing guidance. Stop signs mean just that—STOP! They are most commonly used at plowed road crossings. You must come to a complete stop, look both ways, and be absolutely certain the roadway is safe and free of on-coming traffic before proceeding. Informs riders they are approaching a stop sign and will need to stop ahead at a plowed road crossing; begin slowing down immediately and preparing to come to a full stop as soon as you see this sign. Yield signs inform riders to slow down and yield to on-coming traffic. They are most commonly used at low traffic volume intersections such as a trail crossing or driveway intersection. Look for on-coming traffic and come to a complete stop if there is other traffic at the intersection . You must allow them to proceed before you continue through the intersection. This sign instructs riders to not enter a restricted area or trail closed to public access; it can also be used in conjunction with one-way route signs. This sign (and any sign with black letters on a yellow background) is used to advise riders there may be a potentially hazardous condition or feature ahead. 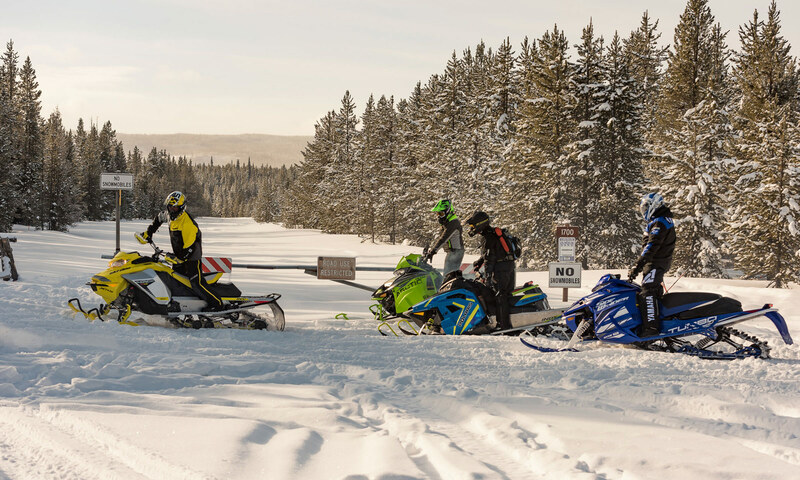 Potential hazards can change from day to day based upon weather conditions, heavy snowmobile traffic, or natural conditions beyond the control of trail managers, so riders should always remain alert for changing environments and potential hazards. They may include changing trail conditions such as ice flows, structures such as a bridge abutments along the trail, driveway crossings, hills, etc. It is the responsibility of all riders to slow their snowmobile as soon as they see this sign and to be alert for potential hazards. Informs riders not to exceed the posted speed; these signs are important since they help manage your safety as a rider, reduce risks to other riders, and sometimes are also used to minimize impacts on adjacent landowners or other trail users. An orange diamond informs riders they are on a designated snowmobile trail or corridor. A blue diamond is used to designate cross-country ski trails; stay off these routes since they are closed to snowmobiling. This arrow sign informs riders that the trail ahead makes a distinct change in direction to the left; slow down to ensure you're prepared to safely negotiate the turn. This arrow sign informs riders that the trail ahead makes a distinct change in direction to the right; slow down to ensure you're prepared to safely negotiate the turn. Several variations of this sign are used to keep snowmobile traffic contained on designated trail routes through sensitive areas such as wildlife winter range or across private property. Snowmobilers must absolutely obey this restriction to help keep continued access across these areas. These signs are used to mark potential collision hazards within the travel-way, such as bridge abutments and railings or cattle guards . The stripes on this sign slope downward, away from the obstruction, pointing to the side of the hazard where traffic should travel.